Jackmanii clematis is in full bloom on a background of colorful green foliage. The bright magenta flowers climb over time, transforming a simple trellis or side of a building into a natural wonder. The colorful blossoms can be seen in many parts of the world and are a favorite of gardeners. Most of the genus clematis comprises leaf-stalk climbers, though there are a few varieties of non-climbing types. There are three groups of clematis, and each group flowers at a different time of year. This means that those who enjoy clematis can appreciate them all year long. Group 1 clematis flower from the start of the year to late spring, while group 2 clematis flower twice: in late spring and in mid to late summer. Group 3 clematis flower from midsummer to early autumn. In addition to the three groups of clematis, there are also the very popular hybrids. Many of these have large flowers, making them ideal to grow against fences and walls. Still others have smaller, daintier flowers, and one hybrid of clematis looks like small tulips. The smaller ones are often used to decorate pergolas and other garden structures, providing both beauty and shade. 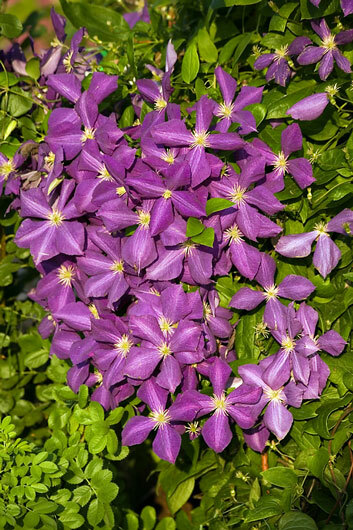 Non-climbing clematis have long, flexible stems that make them easy to twine throughout the lower portions of walls and fences, as well as through other garden plants. Clematis should be planted in dry, alkaline soil, with shade at the roots. They can grow in both sun and shade. As a general rule of thumb, group 1 and hybrid clematis require no pruning. Group 2 and 3 clematis should be deadheaded and cut back to the base after flowering.